Amy Edmondson, a professor at Harvard Business School, first identified the concept of psychological safety in work teams in 1999. Since then, she has observed how companies with a trusting workplace perform better. She states that psychological safety isn’t about being nice; it’s about giving candid feedback, openly admitting mistakes, and learning from each other. In work I do with Executive teams, I always start my leadership interventions with a session on how they can create a learning environment ( psychological contract) as they embark on this learning experience and how they take this back to the workplace. • If you notice, we are not abiding by this agreement – call it out. Many of these behaviours, if also demonstrated in the workplace would also help in creating a climate of psychological safety. I am a great believer that what we see happening in the training room is a microcosm of what goes on the organisation. Where psychological safety does not exist, it can look like its “not safe” to openly express what we want to say and feel, that staff are unable to “rock the boat” by providing contrary or conflicting views to problem-solving and decision making and where courteous compliance becomes the norm. To some extent I see this happening in the training room, so my job is to help those leaders find their authentic voice in order to help others find theirs. 1. Frame the work as a learning problem, that creates the belief that you need everyone’s brain and voice in the game. 3. Model curiosity – ask many questions, and that creates a need for voice. To be able to do this with some degree of confidence and success, it means that in every conversation a leader has with their teams, peers and Boss, all four actions stances need to be present. Without Move there is no action or proposed direction, without following there is no support for others’ ideas, without stopping there are no checks and balances and without bystanding there is no bridging of competing actions. 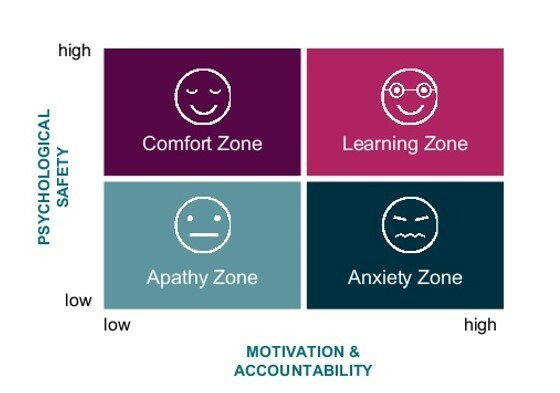 By creating a deeper awareness of preferred communicative stances; the words you choose when you speak and the implicit rules you follow when interacting with others, then the idea of a learning zone becomes more of a reality.